Chef Joe Sasto was a finalist on last season's Top Chef, and was most recently the executive chef of the Italian restaurant CAL MARE in Los Angeles, CA. Before settling in LA, Sasto spent years cooking in San Francisco kitchens, honing his craft at fine dining havens Lazy Bear and Quince. Here, the master of all things pasta waxes poetic on the power of the egg in Italian cooking. 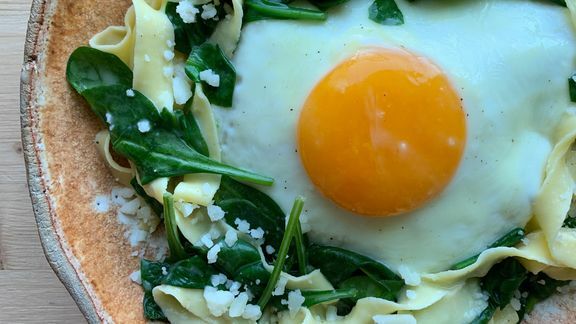 From the bottom to top, eggs are everywhere in pasta. Eggs are pretty much the second most important ingredient in pasta, following the flour, and there’s a wonderful hominess that comes from adding eggs to the final dishes. Eggs are so special because you get the fattiness and richness from the yolks and body from the whites, [and] there are a lot of traditional pasta dishes that use egg as the sauce: carbonara is probably the most familiar. It creates the perfect sauce no matter what the dish, whether you fold it in at the last second, or just put it on top of the noodles and let the yolk run over everything. At home, I usually make cacio e pepe with a little extra butter. An egg takes it to the next level. It's almost like a carbonara without the guanciale. I always try to have one egg dish on the menu. Right now, I'm layering carbonara flavors onto a pizza: a white creamy sauce, shaved guanciale, and egg. Rather than cracking the egg on top, I like to mix it all together with pecorino and parmesan, a little bit of pasta water and pour it all over the pizza. That way everybody gets a little bit of egg and nobody's fighting over the yolk in the center. Sasto’s right, pasta only gets better with an egg on top. Snag this recipe for fettuccini with pancetta and chard—crowned with the crispiest of fried eggs—from our partners at The American Egg Board. To check out their full treasure trove of chef-created recipes, click here! 1. Sauté the pancetta in oil until crispy. Remove pancetta and set aside; wipe out the pan. 2. Sauté chard in butter until tender. Season lightly with salt. Combine the chard and pancetta; set aside. 3. Cook fettuccine in salted boiling water just until al dente. Drain; toss with chard mixture. 4. For each serving, fry each egg in a pan until whites are set (completely coagulated and firm) and yolks begin to thicken (no longer runny, but not hard). Place 4 oz. fettuccine mixture in a pasta bowl, top with fried egg and sprinkle with grated Parmesan and fresh black pepper. Serve immediately.